Want to sit in on a world class Excel seminar? 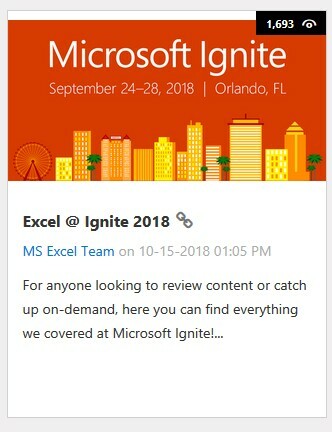 Microsoft has a fantastic seminar Microsoft Ignite for tech professionals including Excel Pros, the most recent was held just over a month ago in Orlando U.S. Sept 24-28 2018. You can view some really top class Excel sessions from this seminar here at this blog link. Excel now has some revolutionary new formulas so that last video in the list might amaze you – formulas or functions that filter, functions that sort. Thank you Microsoft for making these great resources accessible to us :).